Well, one thing is for sure in this round. Celebrity Blogger extraordinaire Megan Castellan will have a saint vying for the Golden Halo tomorrow. Yes, Megan is advocating for both Brigid of Kildare and Egeria, as she has throughout Lent Madness 2015. The real mystery is how she will trash talk herself! The winner of today’s battle will face Francis of Assisi for the Golden Halo tomorrow on Spy Wednesday. Francis trounced Molly Brant, one of the true cinderallas of this year’s bracket, 71% to 29%. To get to the Faithful Four, Brigid defeated Elizabeth, Dionysius the Great, and Kamehameha while Egeria beat Hildegard, Thomas Ken, and Frederick Douglass (click on the names of the vanquished foes to refresh your memory about the information shared about Brigid and Egeria in previous rounds). Don’t forget to catch this week’s episode of the Emmy-winning (fine, we were robbed — again) Monday Madness. Tim and Scott offer Oliver, everybody’s favorite seven-now-eight-year-old Lent Madness oracle, official birthday greetings and share news of great joy — how you can pre-order a mug featuring the to-be-determined 2015 Golden Halo winner. Oh, and does voting for saints feel somehow at odds with the solemnity of Holy Week? Click to read Scott’s contribution to the blog of St. Luke in the Fields in New York City, in a post titled Lent Madness: Holy Competition in Holy Week? Spoiler Alert: He thinks it makes perfect sense. Sure enough, I discovered that Brigid has much to commend her, even besides her penchant for microbrewing before it was popular. Her leadership, her wisdom, her generosity, her tenacity in what she knew was right (she marched across Ireland and back!) are rare and valuable indeed. And even if you are dismissive of ancient tales of columns of heavenly fire, or bathtubs that transform into beer, recall this: Brigid loved the people in her charge such that she made sure they never went hungry or thirsty. She gave away all she had for their sakes. And they saw in her wisdom and courage that could lead them safely. Brigid — with or without miracle tales — lit the light of Christ in Ireland through her words, presence, and actions. What better saint could you ask for? Vote Brigid! When she went on pilgrimage, she wasn’t content with a surface view of the things she saw. She asked questions, she took notes, she recorded everything, she sent her observations back home so everyone there could share her joy. She got to know the people around her, and described them with respect and dignity. She told the rest of the church what Holy Week liturgy looked like, in the place where it all began. Egeria shows us what curiosity looks like, sure. But had she merely been a fourth-century busybody, I doubt her legacy would have lasted. Instead, what Egeria shows in her writing is respect and love for the different people and practices she encountered. It is that love which moved her to learn so much about rituals and customs different from her own and it was love that compelled her to convey the dance of the early liturgies so clearly to her sisters back home. Surely, in our world today, we need more of Egeria’s questing love. Go Egeria! 164 Comments to "Brigid of Kildare vs. Egeria"
After attending the Chrism Eucharist yesterday and journeying through Holy Week, how can I not vote for Egeria. Egeria’s pilgrimage continues to resonate down the ages. We don’t know much about her background, really. For all we know, she, too, may have been without a human family. What matters is that she went on this pilgrimage and shared it with us, her future family in Christ. The most important biblical comment I have evwer heard! Solves the literal/aligorical or old earth/young earth problem! So beautifully said, Diane! I love the concept of “her future family.” Thank you. And thank you, too, Megan for your beautiful summation. You are each and all wonderful. Lent Madness is such a joyful experience not only because we can learn more about these saintly people but also about those who are participating from the SEC to the celebrity bloggers to the commenters of all ages. I will miss my daily dose of madness! Thank you. On the wings of poetry’s sweet perfume! very nice she’s my patron so voted for her…. I vote for Brigid because she had no family. A very happy birthday to you Oliver – I hope it’s been wonderful! happy birthday, Oliver. I too vote for Brigid, but because she is the patron saint of beer. Yes: Happy Birthday, Oliver! We’re very glad you’re here. We are indeed happy to have had Oliver with us and I’ll just bet that he wasn’t bored at all. I seem to recall something someone said one time a way back about becoming as a child. Huuummm. now who could that have been, I wonder? You are very wise Oliver! Have a great year as you journey on to nine! Happy Birthday, Oliver! As others have said – you are very wise. Despite my love of liturgy and this being Holy Week, you hit the nail on the head. Following Christ is about embracing each other as family – we become the family of those who have no others. Happy Birthday Oliver! Your thoughts have been a great help. Happy Birthday, Oliver! I look forward to seeing how you vote tomorrow! Happy birthday from Australia, Oliver. Keep thinking those deep thoughts and keep expressing them so well. I am already looking forward to next year and hope you will be with us. You’be been a shinning light. I’m with you, Oliver. Brigid it is . Also, she has a cool cross. And a very happy birthday to you. Enjoy eight. I was swayed by the meditation on pilgrimage: Egeria it is. My vote is for Brigid. She “lit the light of Christ” through her words, presence and actions. She loved her people and made sure they never went hungry or thirsty. She gave away all that she had for her people. She’s my kind of saint! The deciding factor for me was that Brigid loved the people in her charge such that she made sure they never went hungry or thirsty. Pilgrimage is good, but caring for people gets my vote.. Since I cannot vote for both (I know that Tim is lurking in the background) this diocesan liturgical officer has to cast his vote for Egeria. I vote for Egeria in solidarity as a journalist and writer as well as one who loves liturgy. I vote for Brigid because of her loving ministry. Also, I have sung Samuel Barber’s “Hermit Songs” (settings of poems written in the margins of manuscripts by 9th century Irish monks). In one of the Songs, “The Heavenly Banquet”, the writer says, “I would like a great lake of beer/ for the King of Kings.” Sounds like Brigid! I aspire to be like Egeria; being curious and witnessing what I see and hear to teach/ explain to others. Egeria! It is Egeria for me. I have liked her from my first encounter in church history. Thank you Rebecca. Egeria’s travels were illuminating, but who could resist a battle of the two most likable saints ever–Brigid vs Francis?? Go Brigid, though that will make tomorrow’s matchup the most agonizing of the season. I’m confident that Brigid was a wonderful person and her people were blessed to have her in their presence, but all Christians are blessed that Egeria lived and served the Church as she did. She left a lasting legacy which blesses us all to this day. My vote is for Egeria! Yesterday’s winner deserved it. Yesterday’s unwinner deserved the win. Today’s winner deserves it and so does she who doesn’t win. I’m very impressed, inspired, invested with yesterday today and tomorrow’s candidates. I voted and vote now and will vote tomorrow with a sense of joy and yet sorrow because — such a choice! Tis terrible to be sure. These saint’s have touched my life and will remain as guides and friends and role models as I journey on. Thanks to them and the SEC. We’re down to the Faithful Four in Lent Madness. And I will vote today for Brigid of Kildare. Brigid embodied hospitality for the whole person, the whole beloved community. She longed for people to be inebriated with mercy, peace, and cheerfulness. And she lived with an Anam Cara, a soul friend. This last is what moves me to choose her for the eventual “Golden Halo” when/if she faces off with St Francis tomorrow. My adult life has been nourished and grown by feasting at the Heavenly banquet with many soul friends. Some have been informal and some have been formal time with a Women’s Spirituality Circle, a Spiritual Director or Vision Quest in Symbolic Reality (Sandtray Worldplay) In time, I found myself drawn to this ministry as well and found more soul friends in my Dominican formation program. So today I would like to honor all my soul friends with a vote for Brigid and with mention of the Anamchara Fellowship. May we all drink deeply from Brigid’s Lake. Egeria for the halo! No. Wait. Francis for the halo! Sigh. Can there be two halo winners? If tomorrow is a tie. I always heard that Brigid was a Celtic goddess who got morphed into a Christian saint. It’s debatable. Some say she was a priestess of the goddess who led her followers to the Christian faith. I believe she was a real person who after her death probably had some of the legends of her goddess namesake merge with her life story, though as a “son of a servent of St. Bride I am a bit biased. And many a pagan will tell you that’s the truth! Brigid is lovely, but Egeria is the reason we have the liturgical practices we do. This one is really tough. In my liturgical craft, Emerica has played a huge part of capturing the depth of Holy Week. However, when I was on sabbatical in 2000…part I which was in Ireland…I received a healing while standing in the spring of St. Brigid’s well. I had torn the cartilage in my right knee and was having a fair amount of difficulty. Suffice it to say, after prayer and standing in the spring, I was able to complete my six week project…walking normally and without pain. I cast my vote for Brigid today. Thanks for telling your wonderful story, Frederick. Ever since I read about Brigid in this year’s Lent Madness, I have been unswervingly for Brigid all the way to the golden halo. And yet, I also really esteem and give thanks for Egeria, so this was one of the hardest choices for me so far. I was moved by the story of Brigid’s cloak (from a prior entry). As someone who has breastfed two children and lived on a goat dairy for 15 years, I am especially moved by her reputation as a patron saint to lactating beings. Her sense of hospitality, her courage, her leadership. I honestly have never come into a saint’s story that moved me as much as that of St. Francis until now. Hmmm…Android didn’t like my spelling of Egeria. I missed it. I have voted for Egeria the whole way. When I was in seminary as a Methodist, it was the rediscovery of Egeria’s reports, the renaissance, so to speak, of liturgy for the Methodist church, that led to my hunger for more–and, ironically, led me to the Episcopal church. That was a wonderful homecoming for me–and I hope the Methodist ministers in my family tree have been able to celebrate that with me from their heavenly home! But it IS Lent Madness, after all, and here I find myself, madly, voting for the saint for whom I have not voted once during this entire process! I reread her initial biography, and was very impressed by her life. I vote not for beer nor for Ireland, but for a life of amazing service and compassion. I vote for the first female bishop, and I vote for the saint who can best give St. Francis true competition! all i can say is that if Egeria wins can we not use this icon on the mug??!! Great write-ups. Really. While I used to home-brew, I am now preparing to travel. May I also serve God while I do it,…and follow Egeria. I have loved Egeria from the very beginning. I love Brigid, too, but I feel we already know and laud her enough already. I can’t think what our Holy Week observances would be like if we didn’t have Egeria’s writings. So I’m voting for Egeria in hopes she will wear the Golden Halo! If it were not for the compelling and immensely readable writings of Egeria, I wouldn’t have known how to shape what I hope are inspiring Holy Week services; in fact, none of us would! It seems most appropriate for this relatively unknown saint to win the Golden Halo during Lent – a time most assuredly shaped by her lovingly recorded travelogue. Vote for Egeria! I remember the day of your ordination as a Deacon well! Not only the Bishop’s words but then there was that column of fire…! Thank you for reintroducing me to Egeria this Lent. I met her in a Christian worship class many years ago and am grateful to LM for bringing her back into my life. I am blessed to be walking with her through the Great Week. Too many weird miracle stories with Brigid, although the beer legends obviously are based upon sound and reliable tradition. No, I get it, the Irish wrote those stories while drinking a troth of beer. So, I’ll raise a bottle of chocolate stout, a Palm Sunday gift from my lay liturgical coordinator, and vote for the most important Episcopal saint . . . Egeria! Needing more of Egeria’s questing love made the choice for me. Also, that she wanted learn about different customs and rituals and didn’t just dismiss them as wrong. Go Egeria! Egeria – adding to the human body of knowledge, especially about good stuff, is important. But I’m REALLY voting for Megan Castellan! She rocks! Thank you, Megan, for two terrific, wonderful, insightful write ups, but this line struck a cord inside me and generated a vote for Egeria. Although I planned to vote for Brigid anyway, thank you, Frederick Mann, for sharing about your healing at Brigid ‘ s well. Just as there were 3 women at the cross (Jn 19:25) it seems appropriate to have had 3 women in the crossfire of Saintly 4. Looking forward to the penultimate match-up. Mea culpa, I amend my comment to “crossfire of the Faithful four”. Still learning the terminology of the bracket in my novice year of LM. Egeria certainly gave people of faith in all ages lovely, important gifts. She was a heck of a reporter. Her halo must be handy as a reading lamp. But, oh, Brigid, born a slave but choosing all her life to seek and share love. She tried to redeem her dad, rescue her mom, feed the hungry, tend the dying, and in all ways serve anyone within reach as Christ would have done. Go Brigid! risking all sorts of censure — too early for spirits? The things you say! LM needs! a LIKE button. I’m ready to lift s mug of brew now, Donna! Here’s to Brigid! I vote for Egeria. I admire her courage, and I thank her for recording what led to our beautiful liturgy today! I am glad the writeup for brigid didn’t have much to do with beer, it cheapens her ministry. I was inspired by brigid’s selflessness and committment to the people under her, a servant first mentality is something all leaders should have, and certainly all those emulating jesus’ ministry. What a choice. I want to vote for Egeria because of who she was and because of her foundation, but Brigid is such an example of holy love, and the poems of the early Irish church are so beautiful and inspiring- and her well still works. I have to vote for Brigid. We need more Egerias, curious people who explore the world with an open mind and a kind heart. It is Holy Week and Egeria has my vote. I don’t know how much of my decision making process is driven by the actual lives of the saints or the write ups of their lives. I suspect it is driven by the writing, so kudos to Megan for these bios. As has been noted, both are already winners, both already have their eternal rewards, so I am choosing my favorite. This morning it goes to Brigid, for the hostess she was, feeding and caring for the poor around her, giving away all her possessions, concerned with the whole body of Christ. Once again I am inspired to drink in the beautiful mystery of our liturgy, while my every day life is inspired to do more for the poor in my community. Thank you for this Lenten inspiration. This is really tough. Both are wonderful saints. But if I have to pick one, which I have too, I’m going with Bridgid. My grandmother and my mother would be pleased with that. The more I read about (and by) Egeria, the more intrigued I have been. My Episcopal 101 class read some of her descriptions of Holy Week in Jerusalem as we prepared for Holy Week at St. Thomas. Our parish is sending pilgrims to Jerusalem in late October, so I know many people are also pondering that holy place as they make their plans. Pray for the peace of Jerusalem, and vote for Egeria! Brigid blessed Ireland, Egeria the whole church, then and now. Thanks, Egeria! Although active in church archives and history, I consider simply recording activity less saintly than living it. Egeria walked farther and left more tangible legacy, but Bridgid gave them food and drink, which I consider more saintly. Both women are very worthy of attaining their special place in the Faithful Four. Both certainly praised God though their character, kindness towards others, and in Brigid’s case, use of natural resources. I am voting for Egeria because of her appreciation of the differences. She took the time to study the different customs and rituals and found the unique beauty in the variation. Today’s a toughie. I love them both! Sadly, both cannot win. St. Brigid of Kildare it is. I do love Brigid’s story, and have voted for her in previous rounds. I won’t be at all disappointed if she is in the final. But I cast my vote for Egeria and her “questing love,” and her pilgrim’s heart. This is SO hard and tomorrow will be worse, I know. As a journalist I voted for Egeria before, but as a person of Irish descent who doesn’t particularly like beer but likes to make sure no one goes away hungry, I voted, this time, for Bridgid. I’m sorry, Egeria, and I will surrender my membership in Women in Communications if you think I should. I named my daughter Brigid for a number of reasons (bathtubs of beer was good enough for my husband!) so this was an easy choice! Egeria has been my choice all the way, and I cannot leave her now. I am ever so grateful for her foresight in recording Holy Week liturgy so that, all these many centuries later, we observe this week around the world, across cultures and languages, in a way that links us to all who have gone before and all who will come after. I am humbly thankful for Egeria’s life and so cast my vote for her. Well said. I voted for Egeria and will be thinking of her as I go through Holy Week and her words that connect us through the ages. Thank you Megan for the wonderful write-ups. Two awesome women, and one awesome writer. Have to give a shout out to Megan, who so beautifully extolled the virtues of both saints. It’s Egeria for me, although I treasure my visit to Bridgit’s well. It is Holy Week and as a lay liturgist, I am so appreciative of Egeria’s contribution to our knowledge of early observances of this unique and spiritual week. I am so disappointed the voting seems to be moving away from her. Please bring her back if she loses in this round! I’m voting for Egeria, but if I had to bet, suspect it will be Francis and Brigid. Two great saints, to be sure, but how predictable and (in my opinion,) boring, Lent Madders. I, too wish we had less “famous” saints in the final round. Boring may be a good word. I have fallen in love with Egeria and want her to receive her due! I also didn’t know anything about Brigid before Lent Madness. To me, Brigid is utterly a revelation and an inspiration. I am completely swept away by her story. And, this is coming from a trained historian who has done field work, oral history, and participant observation far from home, who honors Egeria. Certainly I will be consciously thankful for Egeria’s work as I go through the Holy Week liturgies. And yet: Brigid’s power of example illumines my way irresistibly. It’s a beautiful story, I agree! How sad that you learned nothing new and were uninspired by these souls. I certainly have grown through the CB’s writing and many of the comments and a grateful to have had the experience. Boring — You really wouldn’t want to know what I told my kids both my own and in my classes when I heard “I’m bored”. I agree…Francis and Brigid is a bit ho-hum. Being Irish I had to vote for Brigid. Though I wouldn’t be sad if Bridgid wins. Definitely Go EfM! Internationally and FUN! St. Brigid: the archetype of radical hospitality and love for one’s community – and she had a very large vision of who was included in her community! And, the first woman bishop. Versus a travel writer. St Brigid all the way! I vote for Brigid. I wore a pendant of her when I carried my daughter. I really feel her presence helped the two of us through a difficult pregnancy. I’ve tried in voting to cast my ballot for the person whose impact for good has been wider and more lasting. Not always easy in these LM matchups! But today, given Egeria’s remarkable contributions to liturgy down through the ages, through hundreds of generations of worshipping Christian people, the choice seems obvious. Because I am teaching about hunger and the wise and loving use of resources for the hungry, I had to go with Brigid. I voted for Egeria and although so far Brigid seems to be winnning, I have one consolation: My vote tomorrow will be much easier than if Egeria wins today. I’m a wee bit Irish but my college major was 100% Journalism. Egeria it is! 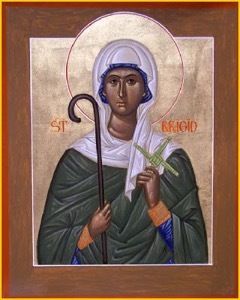 I love Brigid, and we will be celebrating her in a Celtic service next month. But I’ve also been trying to support the less well-known folks here, so I’ m going with Egeria again. Oh, and did Brigid write that wonderful Lake of Beer piece? Egeria – please! – I don’t think either Brigid or her have a real shot at the “Kentucky” of this year’s Lent Madness – the powerhouse St. Francis, but if anyone can hit that last second bucket, it’s Egeria. After all, she could almost be considered the “Michelle Naismith” of much of our liturgy. And I know that she won’t choke like Notre Dame did in the “Elite” Eight! I have to go with the early church historian, Egeria. Egeria! Please, everyone vote for Egeria. She is my new favorite saint and I would dearly love to have a mug commemorating her so I could have lots of opportunities to tell people who she is. As a cultural anthropology student who never made it to the field she embodies the work I would have loved to do, traveling, recording, immersing herself in the culture of a particular area and then moving on and doing it all over again. Brigid is cool, but everyone already loves her. You got my vote today and hopefully tomorrow! I want her mug in the worst way! Brigid did great things and is deserving of all honor and praise. However, the historian in me has to vote for Egeria. It is people like her who have given us the best of history — a true account of what happened, and when, and where, and portraits of the people of the times. I voted for Brigid because she had a story like The Silver Chair at the beginning. Hi, Martin, and welcome to Lent Madness. My oldest son is named Martin, but he is much, much older than you! I hope you’ll join us again next year. Hey Martin! I enjoy the Narnia stories too! Happy Lent and then, Happy Easter! Go Martin! You LM Kids have it right. This was a really tough choice. I voted for both of them all the way through. I love Brigid and her walks across Ireland, loving her people, but when I go on a trip (not just a small weekend one but a long one) I keep a journal full of what I have seen and what I have heard, to share with my family. On that note, I must vote for Egeria. The need to share important things with others is hard to pass up. I HATE these tough decisions. Happy Birthday Oliver. See you at church on Sunday. Love Brigid but voted for Egeria. Such a hard choice!!!! I can’t decide if I should vote for the most-likely-mythical saint/Goddess or the real Christian whose existence is historically verifiable. Cool myth or actual contribution to liturgy. Because the liturgy is a big part of what drew me to the Episcopal Church, I cast my vote for Egeria today. And because I see which way the tide is turning, tomorrow I will take great pleasure in voting for Brigid for the Golden Halo! Thank you, Megan, for two fantastic essays on both saintly women with no bias to sway the voting either way. But then you now will have to create yet another essay for the winner to face off in the Golden Halo determination tomorrow! May God’s Spirit be with you! And thanks again to all the celebrity bloggers who have given of their time and research to write all these essays to illuminate the lives of all these wonderful saints of God. May we all learn and emulate all the best qualities we have learned from them all and put those into action in our own lives. I’d vote for Oliver if I could – for his short, but wise, posts. Can I nominate him for the role of celebrity blogger next year? A we move toward the powerful liturgies of the next few days, I have to place my vote for Egeria. It was a tough call indeed! In the end I voted for Brigid, as I am born on Feb. 2. This year our parish had a Candlemas celebration and learned about Brigid. We made candles and ate crepes, the traditional Candlemas fare in France. Happy Birthday to Oliver! Your insights made my mornings. Blessings to you! As a member of the congregation of St.Jude Episcopal in Ocean View, HI I feel I must vote for the saint known for her radical hospitality. Go Brigid! Wow! Egeria for my vote even though she is going to lose. It is so close! Brigid squares off so cleanly with Francis, that I must vote for her. Both devoted to poverty, simplicity, and aid to the poor. Ireland vs. Italy tomorrow for the World Cup! Two wonderful saints of the faith that makes this perhaps the most difficult of choices for my day. Brigid it is. But, Egeria, Bless you. Brigid still needs lots of votes to wrap this election up.. and tomorrow, well. VOTE IRISH! Both clearly are worthy souls… but Francis already has so many historical references and kitch… let’s go for broke with the Patron Saint of HomeBrew! Going home to drink that chocolate stout in honor of Brigitte now . . . and cast my vote for Egeria. Oh, did I vote already? It seems like a whole day since this morning . . . one vote per day? Boston Irish vote early and often . . .
May Oliver have the very best of birthdays and may his wisdom continue to grow with each passing year. Perhaps he will have a future in writing saintly blogs for Lenten Madness. This is a delicious dilemma for me. I have family reasons to lean toward Brigid. I love Megan Castellan’s story about her ordination to the diaconate, for both its resonance with Brigid and for its colorful particularity. I find myself voting for Egeria. Lent Madness has introduced her to me — and she’s awesome — and it is Holy Week. In my estimation, either or both are worthy of golden headwear. So the outcome today will be satisfying regardless. And then tomorrow will be . . . . a thing of beauty, to be sure. I thought Oliver was eight. What’s it gonna be kid?! Oliver was 7 but he just had a birthday so now he is 8! And so wise! But, for the record, I voted for Egeria! This is the toughest choice of all! Whichever wins will get my vote for the Golden Halo tomorrow, but, truly, I am torn between the bounteous hospitality of Brigid (and Susan B’s reminder of the Lake of Beer for the King of Kings – that SO meets us where we are in the world, which is where God meets us every time) and, as a writer myself, the lovely and important documentation of Egeria, and especially the fact that she embraced the differences and recorded them faithfully. Would that we all did so today, instead of judging and rejecting others on their differences! And I think that decides my vote: Hospitality is wonderful and welcoming, and I am intrigued by the Lake of Beer for the King of Kings, but Egeria sets an example that is so needed in our world today. Egeria for the Golden Halo! I have become so engaged with Egeria that I’ve not opened her diary even though my fingers are itching to do so. It’s saved for the early hours of Friday morning as I am in vigil at the altar of repose. I loved Peg S.’s summation of Bridgit’s qualifications, and I think she’ll probably win. But I still have to go with the woman who traveled so far and shared what she found with the rest of the church. Her writings and the liturgy based on them have fed people’s spirits down through the centuries. Here’s to Egeria. Is that beer from THE bathtub that you’re toasting with? Oh, and Happy Birthday, Oliver! I’ve enjoyed following your votes. As well as adding a “Like” button to the comments next year, I think we need to get more children involved. Their wisdom is insightful. I’m thinking of having my confirmation class do LM next year. The eyes of the young are so full of stuff that we old folks miss. This was a hard choice. Two fabulous Christian women. One who had a major influence on how we celebrate Holy Week and the other who led the life of a servant who provided food and drink to the poor. I have to go with Bridget for her selfless dedication to her faith. Count me in for an Egeria mug with the Spanish stamp…I’m sure she would defer to St. Brigid anyway. Egeria – for the rare and precious gift of a female historian in the written records of the early church. Egeria seems to be a better and more Episcopal choice to me: reporting about the early church in the people’s tongue; writing of all of the ways people had good worship; and giving the church a woman’s point view on meaningful worship. 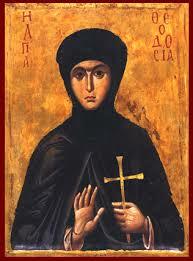 Egeria gets my vote today … I am going to miss my daily saints!!! Thank you!! And … Happy Birthday Oliver from California!!! My vote is for Egeria. As I walk thru Holy Week, I am thankful for Egeria’s writing about liturgical practices of various Christian communities. This is the time of the year I appreciate her notes; because it is in our various Holy Week celebrations that we dramatize how much God Loves US, like it or not. I am from the Diocese of Maryland and I am so grateful that Egeria did not give us an alcoholic beverage. You wouldn’t have had to drink it just because it had been given, if it had been given. Now I look forward to each and every service…and we have one every single night! Evensong on Monday has moved a groundswell of support for having it more often; the opportunity to write down my burdens on a piece of paper and offer them up to God in such a physical way has freed me up much more to respond to the Resurrection story (and they will be burned in the new fire on Saturday). The healing blessing was a great gift, as well. Egeria it is, for me!